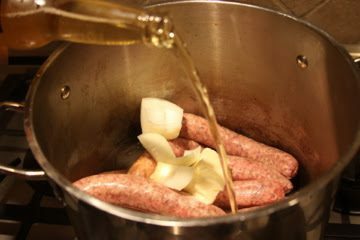 1 dozen brats Beer, to cover 1 medium large sweet onion, chopped 2 ounces (1/2 stick) butter Place brats in a large pot with onions and butter, cover the brats with beer. 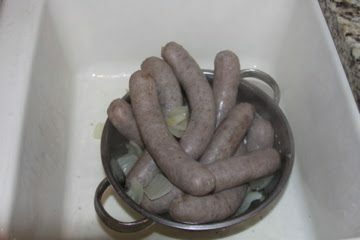 Bring to a boil and reduce to simmer until brats are cooked ~ 15-20 minutes. 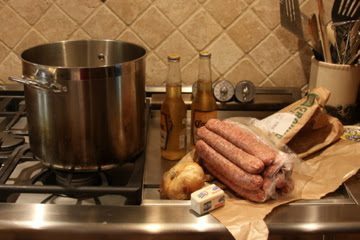 Remove brats and set aside beer mixture. Grill brats until golden brown. Serve brats on buns with sauerkraut, onions, ketchup, and/or mustard. ***I boil the brats at home, and then transport them to the tailgate to grill.